Supporting enterpreneurship in Langa township of Cape Town, South Africa, 2016. We arrived in the township of Langa with just three weeks time to help a local entrepreneurial couple, Luvuyo and his wife Dee, improve their small business. Our team consisted of four designers, one local business student, and a navigator from the community. We worked together over the following weeks, bridging the gaps of culture and knowledge, to develop an exciting range of design concepts to help our entrepreneurs improve their business in the near term and realize their future aspirations. Our first challenge was to become familiar with our entrepreneurs while quickly gaining an understanding for their community and context. We accomplished this over several days of informal conversations, strolls through neighborhood streets, and interviews with our navigator and other local experts at the Langa community center. Over this time spent engaging with our entrepreneurs, the complexities of their business began to emerge. We discovered that Luvuyo and Dee didn’t operate just one business, but a set of complementary businesses - each with its own narrative, financial returns, and trajectory. 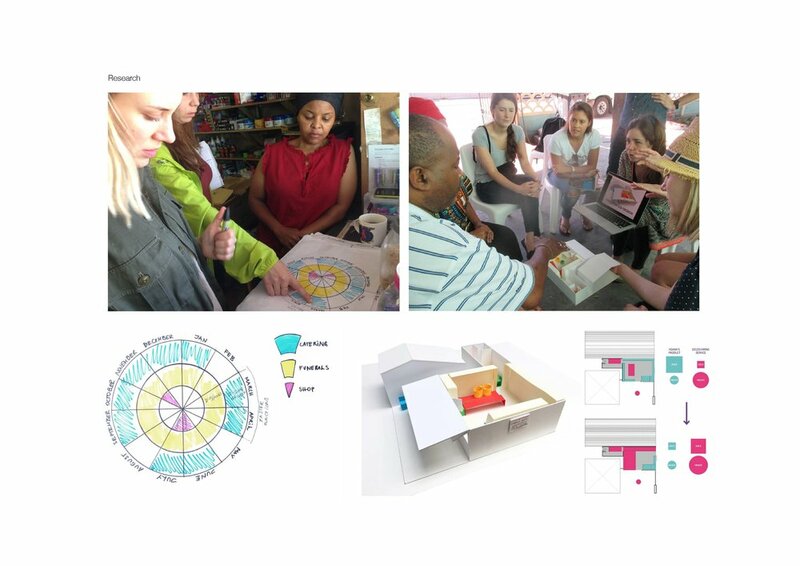 The next phase of our research would require us to develop methodologies to dig deeper and quickly unpack these businesses to find opportunities for design intervention. Bring the business out from behind the restrictive bars of the shop and into the community through branding and the use of public spaces. At this point, we moved into a building and prototyping phase, co-designing with our entrepreneurs and quickly iterating solutions to test their efficacy. We had only a partial understanding of the direction we were headed, but though the conversations that arose through physical prototyping, we were able to arrive more quickly at some meaningful solutions. Our deep dive into the lives of Luvuyo, Dee, and their community forced our team to venture far outside of our comfort zones. Each day we uncovered new pieces of information that completely changed our perspective and understanding of the problems we were trying to solve. Despite these challenges, we were able to deliver several solutions that were met with great enthusiasm by our entrepreneurs. With these tools in hand, we hope Luvuyo and Dee will have greater success in building their new business into the future.